Courtesy photo Pictured, from left, are Lisa Woods, Home Health & Hospice Care adult bereavement coordinator; Linda Doherty Riley, HHHC child bereavement coordinator; Megan Drury, Friends of Hudson Littles co-founder; Jennifer Ceballos, founder of Friends of Hudson Littles and their children; Tina Andrade, HHHC director of development; Meghan Stavro, group member. 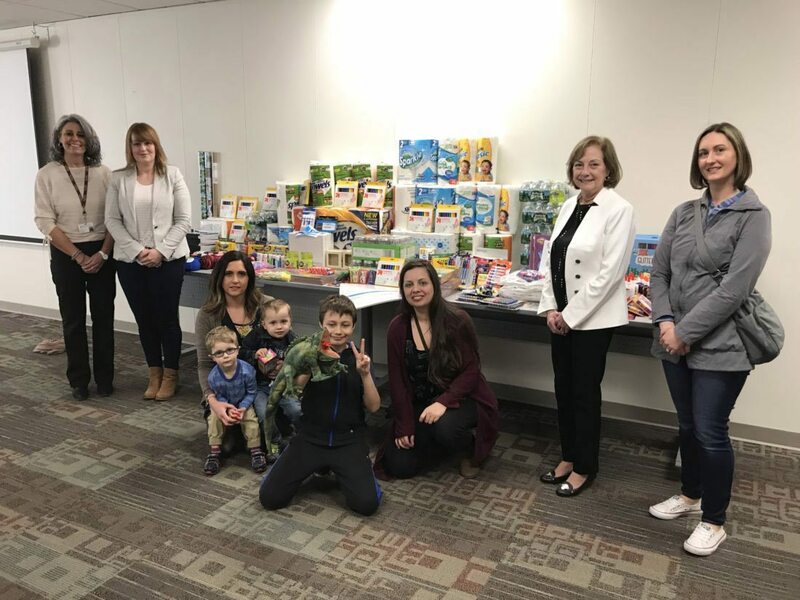 Home Health & Hospice Care’s Good Grief Program received a wonderful boost last month with a generous donation of arts and crafts supplies from the Friends of Hudson Littles, a parent/caregiver support group based in Hudson. The Good Grief Program is a support group for children aged 4-13, who are grieving the death of an immediate family member. The program is led by Home Health & Hospice Care’s Child Bereavement Coordinator and the Good Grief Clinician, a qualified art therapist. Specially trained bereavement volunteers help facilitate each session occurring twice monthly during the academic year in Merrimack. The Good Grief Program also has a sister program, Teen Topics, for high school aged children, occurring once monthly on Sunday afternoons. Both groups are currently accepting registration for fall 2018. The Friends of Hudson Littles group was established on Facebook in 2016 by Jennifer Ceballos, as a way to connect with other parents and caregivers in the Hudson area and now has more than 200 members. Their goal is to support the community with regular fundraising for local groups and charities. Their donation was delivered by founder, Jennifer Ceballos; co-founder Megan Drury; member, Meghan Stavro and some of their children. They always welcome new members in their efforts to support each other, their children and the community of Hudson and neighboring areas. If you are interested in Friends of Hudson Littles, you may message their private Facebook page for more information. For more information on Home Health & Hospice Care’s Child Bereavement Programs, or to access Bereavement Support for grieving children, contact our Good Grief Coordinator, Linda Doherty Riley at 420-1914 or linda.riley@hhhc.org. Home Health & Hospice Care also provides bereavement programs for adults grieving a death. All groups are open to the public and are free of charge. We are always looking for volunteers for our bereavement programs. Visit our website or contact our Volunteer Coordinator, Tanya Prather, for more information – 420-1962 or volunteer@hhhc.org.